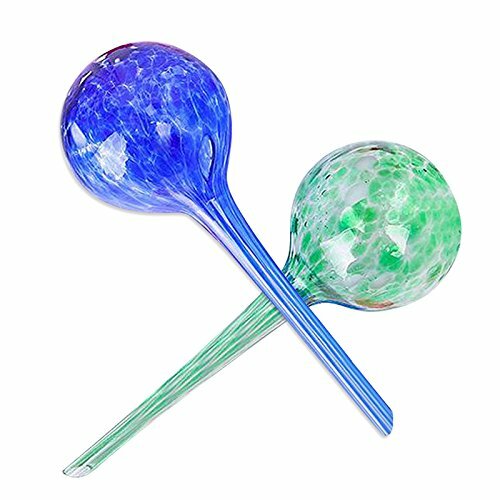 KINGLAKE 2 Pcs Self Watering Globes Large,Automatic Plant Watering Bulbs for Outdoor Indoor Garden 12” long x 3.3” diameter (Random Color) by KINGLAKE at Tulips Orchids. MPN: TRTAZI11A. Hurry! Limited time offer. Offer valid only while supplies last. Product Description: Self Watering Globes Size:12''long x 3.3''diameter. Hand blown glass design decorates your home or garden.Also have practical use. Self Watering Globes Size:12"long x 3.3"diameter. Hand blown glass design decorates your home or garden.Also have practical use. Automatic Plant Watering Bulbs for Outdoor Indoor Garden Plants. Very Easy to use. Just fill and insert into soil. Good helper in life. Package Qty:2 Pcs.Color shipped randomly.Safety Packaging,Great Gift choice.